Where to Buy Onslaught Microencapsulated Insecticide, Onslaught Microencapsulated Insecticide - Pt - Gal - $45.95 for Sale with Fast Free Shipping! 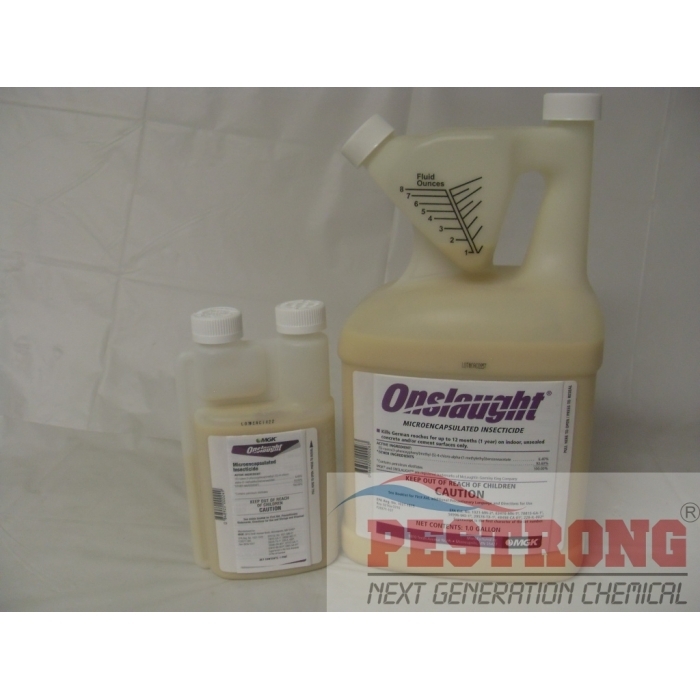 Onslaught Microencapsulated Insecticide - Pt - Gal provides long-lasting residual up to 5 months control of a broad spectrum of insects. By buying this product & leave product review you can collect normally 28 reward points as a voucher of $2.80(1%). 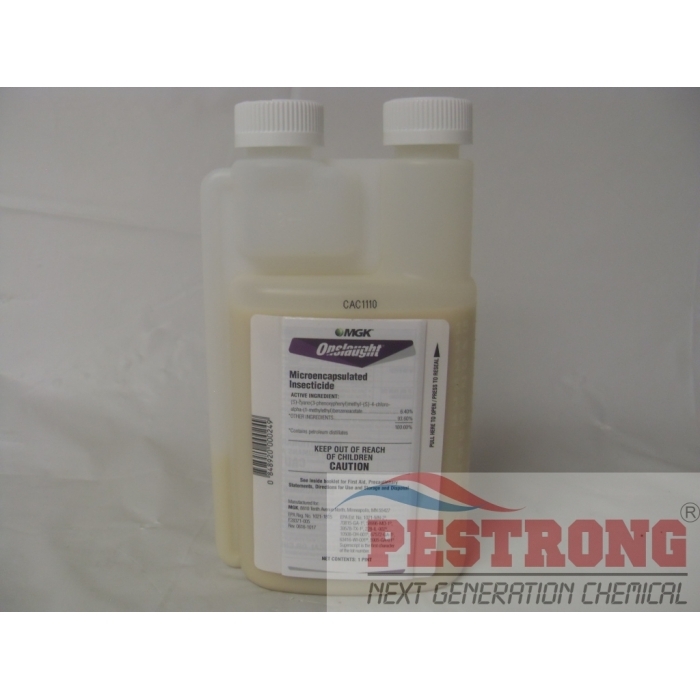 Imidacloprid 0.5 G Generic Merit Criterion..
Onslaught Microencapsulated Insecticide - Pt - Gal provides long-lasting residual up to 5 months control of a broad spectrum of insects. Nothing is proven to work better on tough pests like bedbugs, spiders, and fleas. Control over 200 insect pests. Shelf life is 3 years in original commercial packaging. The active ingredient is Esfenvalerate 6.4%. Use as a tank-mix partner with Gentrol IGR or Precor IGR to eliminate insect populations and prevent reinfestations. 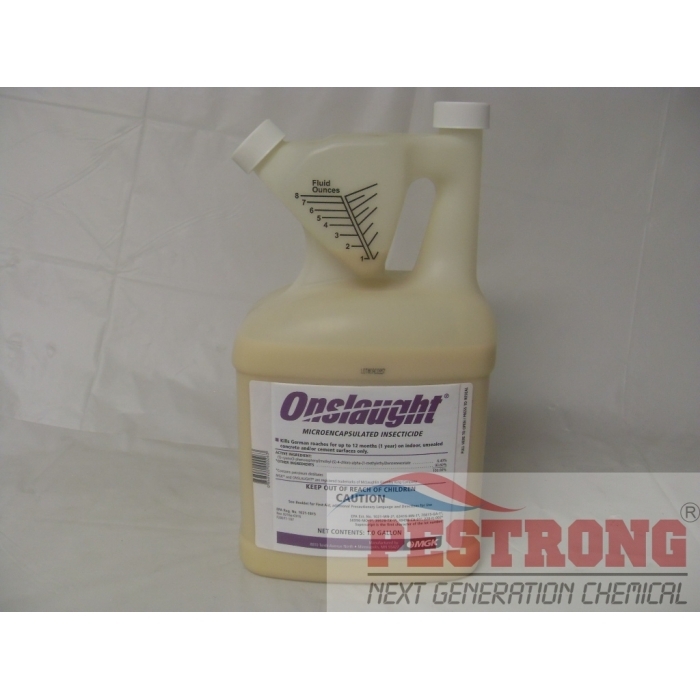 Onslaught Microencapsulated Insecticide is a microencapsulated suspension concentrate containing 0.54 pounds active ingredient per gallon. The suspension is only intended for dilution in water, not oil. Onslaught Microencapsulated Insecticide may be sprayed on any surface that will not be stained by water. If you are concerned about staining or are not sure if a surface is water safe, test the surface by spraying a small amount in an inconspicuous area before making a broad application. Shake Onslaught bottle well prior to mixing. Clean spray equipment before using or diluting Onslaught. For dilution, add ½ the required water to spray tank, then add the appropriate amount of Onslaught. Agitate the mixture, and then slowly add the remainder of the water. Agitate the spray thoroughly before using and also occasionally during use to ensure dispersion. If you use a spray filter screen, it should be 50 mesh or larger. Tank mix Onslaught with an IGR such as NyGuard IGR Concentrate to break the insect growth cycle and control future emerging insect populations. Do not apply Onslaught as a fog or space spray. Fog first with a product such as Riptide Water-Based Pyrethrin ULV to get the quick knockdown action of the fog followed by a surface application of Onslaught for residual control. Always follow label instructions and use rates for each product to be applies. We,pestrong.com got excellent result to get rid of bed bugs, fleas with onslaught insecticide. We sprayed around our home, under our home and in the yard. Absolutely no odor! It has been two weeks and no bugs around. I recommend this product who has problem with all the bugs around the house!!! We sprayed around our home, under our home and in the yard. Absolutely no odor! I made a light mix for inside the house and the trees and shrubs, and a heaver mix for spraying the outside of the house. All of the bugs are dead, including ants,spiders,wasps...all of them dead!!! This is awesome product i ever tried!!! We have a 3000 sqft home. We used this in combination with CB Invader Propoxur Aerosol Insecticide. Have almost eradicated our problem of German roaches. Will keep using, obviously works!! Thanks for the products and fast shipping!